All I keep thinking to myself is “wouldn’t this salad taste really good if I were eating it from the deck of our pontoon boat?” Because, it would, right? No, we don’t have a pontoon boat but we came very close to signing on the dotted line this weekend. We were in Branson for a family reunion and stopped into (two different) Bass Pro Shops to browse around. You might remember that we recently bought a sailboat. A sailboat has been on Paul’s wishlist for sometime now. But my wishlist definitely consists of a pontoon boat. For a long time he resisted. And for a long time I pleaded my case – pontoons are safe for kids; you can have a lot of people on one at any given time; they are decent on gas mileage; you can still ski/tube behind one; they have plenty of cup holders and lounge-style seating and some even have a sink! I mean, what more could you really want? If you ever need to persuade someone, just call me up…I have mad negotiating skills. Case-in-point: Paul is now A.L.L. about pontoon boats. In fact, I had to kick him off of Craig’s List so that I could simply write this blog post. So while we won’t be devouring this salad on our pontoon boat for this Fourth of July, I have a feeling that at some point in our future, we will be cruising around the lake in our Sun Tracker. 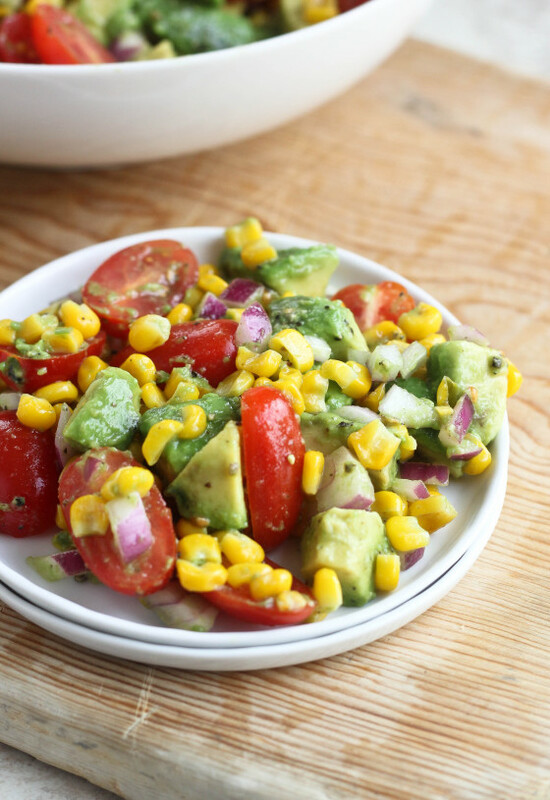 I actually made this Avocado, Tomato & Corn salad for the first time last Fourth of July, and have made a couple of variations since then, and then finally realized that I have never shared it here. I am not sure that there is a salad out there that is more “summer” than this one – fresh avocados, cherry tomatoes, sweet corn, red onion and a little twist of lime juice – that’s IT! Super simple but, of course, the flavors just meld. It’s good with tortilla chips, it’s good in a quesadilla (oh yes, with pepper jack cheese! ), and it’s good with a spoon, straight into your mouth. Thank you, summer produce! 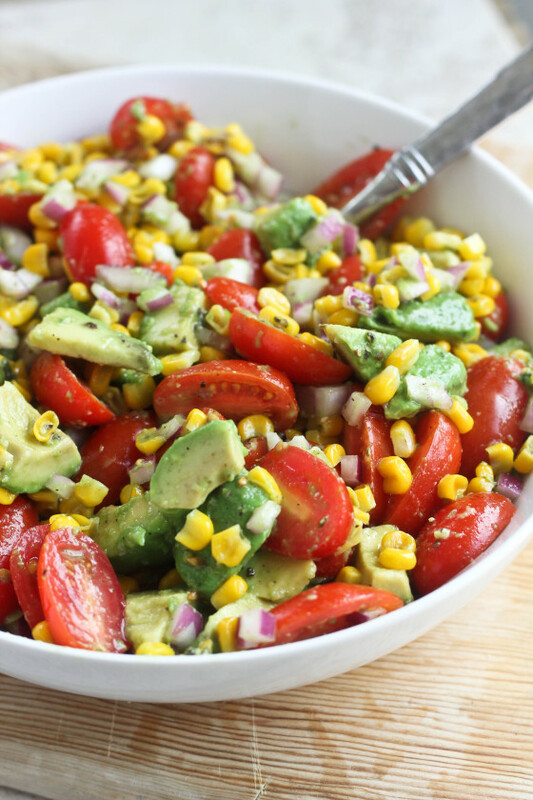 Summer in a salad - fresh avocados, cherry tomatoes & sweet corn, mixed with red onions and lime juice. Perfect for a holiday picnic or summer potluck! Heat a grill pan over medium-high heat and brush a light layer of oil on the pan. Add the corn to the grill pan and cook for about 10 minutes, until the corn is lightly browned, stirring occasionally. 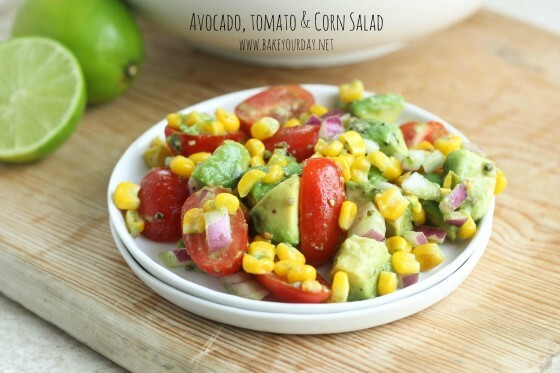 Combine the avocados, tomatoes, toasted corn, and red onion in a large bowl. In a small bowl, mix the lime juice, salt and pepper. Pour over the veggies and stir until combined. Refrigerate the salad for at least 45 minutes, up to 4 hours. Serve cold. To prepare the day or night before: prepare as instructed above, except do not add the avocados. When ready to serve, add the peeled & diced avocados and stir to combine with the other ingredients. The avocados can be added in advance, but will start to brown if the salad is left to chill overnight. Love this salad! And love the idea of a pontoon boat-no better way to cruise the water 🙂 Have a great 4th of July! This salad would be SO good if eaten while on a pontoon boat. DO IT! 🙂 Oh well, I think this salad would be good anywhere! We grew up with a pontoon boat and I have so many memories of it!! It really is one of my favorites. And as a kid, it was the easiest to drive. 😉 I want this! Such a simple salad for summer. Love this recipe! Um, everything tastes better when eaten on the deck of a pontoon boat 🙂 I would looooooove to have one some day! This is a summer salad classic! Yours is so beautiful! ohmygosh this is my FAVORITE ever. Good grief. How fun! I love boating but have only gone a few times. Sailing must be such a fun experience! I could put a serious dent in this salad any ol’ day, and even better to enjoy with friends while sailing! What a great summer salad for the 4th! this salad sounds awesome! my grandparents had a boat & a sailboat when i was growing up and it was so fun to spend days on the lake. i’m jealous of your boat!! Great salad for summer! Love it!!! It doesn’t get much better than this salad…ok yes with a boat it does! Love fresh salads like this! Perfect for summer gatherings! Such a great combination of flavours – perfect summer eating! Oh YES – I love pontoon boats. We totally had one at the Ozarks when I was growing up, but it would be so much fun to pile a bunch of people on one now. Sounds like you guys are having a great summer, Cassie! ok dumb q&a when or where do you use the grapeseed oil?? is it to brown the corn or put with the dressing? Where does the grape seed oil come in. To grill the corn or to add to the lime juice mixture? A pontoon boat sounds so fun! I say DO IT. Also, HOW SUMMERY IS THIS!? I love it. What is the 2 tsp of grapeseed oil used for? It is not mentioned in the directions. Sorry about that! It’s for the grill pan, before you grill the corn. I’ll add it now. Enjoy! Most other recipes similar to this call for 1-2 TBS of oil in the dressing with the lime juice. It would make the lime juice spread over the veggies better. You are welcome to add some additional oil into the salad, but I didn’t find that it needed any. Enjoy! What do you thinking about adding just a pinch of cilantro? I say go for it! I love cilantro, and I think it would go perfectly well with the ingredients in this! Let me know how it turns out! From the pontoon boats you should move up to a trimaran if you want comfort, two heads, sleeps 8 (if you want a ghetto) and won’t sink if it capsizes. We traveled 6,000 mi in ours and ate all those wonderful vegetables in every country, along with tortillas, natch!!! Now I’ll enjoy in again along with fond memories!!! Thanks. Taste delicious!!! I did add cilantro and olive oil with the lime juice. Perfect summer salad. Great call on toasting the corn first. Love the sweetness. And I liked the ratio of lime juice to oil. Perfect recipe. Thank you. I just made this for a quick dinner and then oh my- it is SO delicious!!! I didn’t have avocado so used canned kidney beans instead + used lemon juice instead of time. The toasted corn just sends this over the edge – perfect recipe!